This audio clip is from a discussion on WBFO radio. Based in Buffalo NY, WBFO 88.3 FM is a part of the National Public Radio digital network. If you don't see the player above, it's because you're using a non-Flash device (eg, iPhone or iPad). You can download the mp3 file by clicking here (mp3). It may take a few minutes to download, so please be patient. Buffalo, NY, August 26, 2016 - Each summer, bacteria can force beaches on the Great Lakes to close. Now researchers are battling the bacteria with a genetic-based process. The technique, called Next Generation Sequencing, involves looking at bacteria at the molecular level. Samples of the bacteria's DNA are collected from the water, and are examined to help with identifying the source of he problem. Researchers at the Buffalo State Great Lakes Center will be using the technology in Lake Erie. They'll collect samples near an area that has been plagued by bacteria: Gallagher Beach on Buffalo's Outer Harbor. The accumulation of bacteria can sicken people and pets. And it has triggered restrictions at Gallagher Beach. Right now, it's unknown if the technique is used by other communities in the Great Lakes region, but researchers at the center say the process has been around for four or five years. "There's an emphasis on water quality throughout the Great Lakes basin and ... we are involved in a lot of water quality testing and issues and so on as part of a larger scheme for Buffalo State," said Gary Pettibone, one of the key researchers on the project. He says they will take samples from several sites along the Gallagher Beach area, to determine the bacteria's source. The project will take about a year to complete. Some suspected sources of the bacteria: a storm drain and a seagull nesting colony. 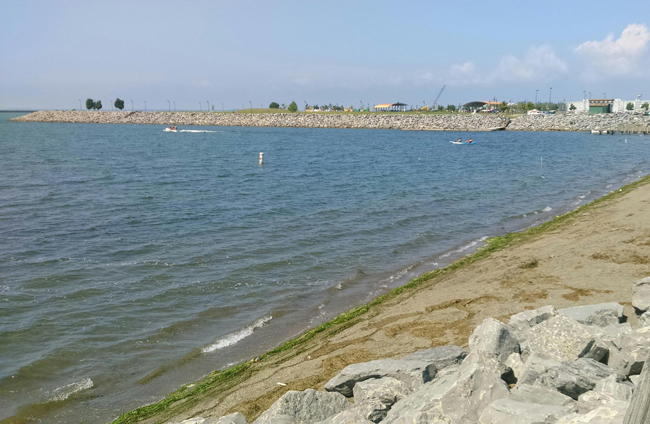 New York Congressman Brian Higgins recently announced New York Sea Grant's support for a new water quality study being conducted by Buffalo State Great Lakes Center at Gallagher Pier on Buffalo’s Outer Harbor. “There is great public demand to make Gallagher Beach a full swimming beach,” said Higgins at a August 26th press conference on the Pier. “Although it is closed to swimming today we don’t need to sit back and simply accept that as the long-term fate for Gallagher Beach." For more, see "NYSG Awards Buffalo State Researchers Nearly $12K to study water at Gallagher Pier."